Last fall, we released the Web Data Connector (WDC) to help you connect to any web-based data source from Tableau. Since then, people have created lots of connectors that pull in data from sources like Dropbox, Fitbit, Twitter, and many others. But WDCs can be used for more than just fetching data. Because it’s a web-based technology, you can use WDCs to trigger external processes such as data-preparation workflows. 1. 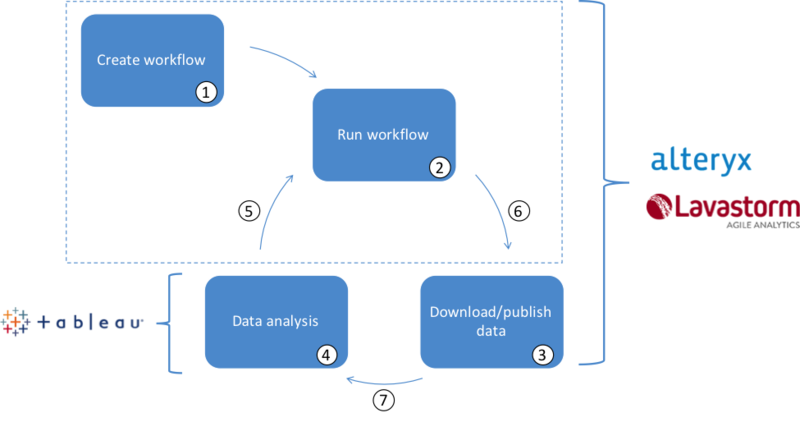 Create a data workflow in your tool (e.g. Alteryx or Lavastorm). 3. Download a TDE or publish it to Tableau Server. 4. Use Tableau to perform data analysis. 5. Go back to your data prep tool to rerun the flow in order to get updated data. 6. Download or publish the TDE again. 7. Resume data analysis in Tableau. 2. Go to Tableau and run the WDC you get from Alteryx or Lavastorm. 3. Work with your data in Tableau. 4. Rerun the workflow (even with new parameters) right from Tableau and work immediately with the updated data. With this new workflow, you can stay in the flow of your analysis instead of worrying about the freshness of your data. “This combination gives analysts the power of flexible, reusable data preparation workflows and faster updates to Tableau visualizations,” says JC Raveneau, Head of Product Strategy at Alteryx. We’re excited to see WDCs used in this new and innovative way and we would love to hear how you’re using them. Please reach out with any feedback or feature requests so that we can continue to grow the WDC ecosystem together!